Looking for a laptop under Rs 30000? You are at the right place, here we have compiled a list of top 10 best laptops under 30000 available in India as of April 2019. These laptops are great for students or professionals who don't need powerful hardware and just need a laptop for daily home or office or college use. We have listed laptops from top brands like Dell, HP, Lenovo, Acer, and Asus. All these laptops come with 7th or 8th Gen Intel Core i3 or i5 processor or AMD A9/Ryzen 3 or 5 chipsets. Both of these processors are good for daily usage like web surfing, watching movies and MS Office apps like Word, Excel, PowerPoint, and programming as well. Some of the laptops have Windows 10 pre-installed and some of them come with Linux or DOS. If Windows 10 is not installed then you can do that on your own without any issues because the hardware is perfectly compatible. Some users ask us for laptops with Intel Core i7 processor under 30000 but unfortunately, those are not available. The best you can find under 30k is Intel Core i5 processor. The price of laptops on this list is between Rs. 25000 and Rs. 30000. If you are on a tight budget then take a look at our list of best laptops under Rs 25000. On the storage side, you will see 1TB hard disk in most of them with 4 to 8 GB of RAM. If you multitask a lot then you can get 4GB extra RAM installed as there is one extra slot for that. For graphics and games, most of the laptops have an integrated graphics card. Laptops with dedicated graphics will cost you around 10000 more. So let's take a look at our list of top 10 best laptops under 30000 in India. Lenovo Ideapad 320 is a decent laptop for basic users under Rs 25000. It comes with DOS but you can install Windows 10 on it and it will work great. The build of the laptop is solid as with the Lenovo branded laptops. It has a rubber detailing on the bottom cover maximizes ventilation and extends the life of the product. The display comes with an extra-flexible 180-degree hinge ensures increased maneuverability and also reduces any excessive strain on the hinge thus preventing unforeseen damage to the display. The processor is 6th gen i3 chipset and 4 GB DDR4 RAM which can handle everyday tasks with ease. You get 1TB of storage to store all your movies, music, pictures and documents. The display on this laptop is 15.6 inch with HD resolution and has good viewing angles. The after sales service from Lenovo is decent so no issues on that front as well. The Battery on this laptop offers a backup of around 3.5 to 4 hours which would vary as well your usage. Overall, it is one of the best laptop under 25000 from Lenovo and is one of the best sellers as well on Flipkart with over 4000 ratings. HP is one of the best laptop brands in India and this laptop is also a good product overall. The build is average but the specifications are good where you get 7th Gen i3 processor with 4GB of RAM and 1TB of storage. HP after sales service is also good so you won't face any issues with that. The display is of 14-inch size and has a resolution of HD. The display is good but not that sharp. The colors and viewing angles are great. The laptops weigh just around 1.5 Kg and because of this it is a great option for travelers as they can carry it with ease. It doesn't have Windows pre-installed so you have to do that on your own. If you are looking for a laptop for light weight laptop for day to day usage then this is a one of the best under 30000. This laptop from Acer has the latest 8th Gen i3 processor which is efficient and powerful so you can expect good battery backup and smooth multitasking. The build quality is excellent and feels durable. You get Windows installed on this device as well. It has a nice 15.6-inch display with Full HD resolution and offers good clarity. Full HD display looks really nice and sharp. The color reproduction and brightness levels of the display are decent as well. This laptop is suitable for normal use like browsing, watching movies, and office applications and should not be used for heavy gaming task. It has a couple of USB and HDMI ports to connect to a pen drive or any other external device and gives an excellent battery backup of around 7 hours with normal day to day tasks. Acer provides 1 year of international warranty with its laptops and this also has the same so you are protected with any manufacturing issues. If you need a laptop which looks nice, comes with the latest Intel processor and Windows 10 then this is a great option under 35000. This is a very sleek and stylish laptop from Asus and it weights only 2 Kg. The build quality is good and overall performance is decent for this price. It is one the best looking laptops in the range of under 30000. The display on this laptop is 15.6 inches large and has a resolution of HD. The display quality is good with vibrant colors and good viewing angles. The laptop is powered by 7th generation Intel Core i3 chipset with 4GB of RAM and 1TB of hard disk storage. The hardware configuration is good and can handle every task like web browsing, movies, MS office apps etc without any problems. Windows 10 is preinstalled so you can start working on it. The blue light from displays affects our eyes. This laptop comes with ASUS EyeCare mode helps in reducing blue light levels by up to 33% to make for a more comfortable viewing experience, and to keep eye fatigue and other ailments away from you. This is very useful for those who use their laptops for 8 to 10 hours a day. Another nice feature is ASUS IceCool Technology which doesn’t let heat build up under the palm rest of the laptop and ensures that the temperature of the palm rest surface remains between 28 - 35 degrees Celsius. Overall, it is one of the stylish and lightweight laptops with decent hardware configuration under 30000. This is one of the most economical laptops with Core i3 7th gen chipset which makes it one of the most powerful and power efficient as well in this range. It comes with a nice 15.6-inch display which is sharp and looks good. The battery is just 2 cell but thanks to power efficient processor, the battery backup is good. You can expect it to last for 5-6 hours on a single charge. The RAM is 4GB and storage is 1TB which is sufficient for normal usage. The laptop comes with a CD/DVD writer and multiple USB and HDMI ports are available to connect devices like pendrive, external hard disk, mouse, keyboard, projector etc. It comes with 1-year international travelers warranty which means you can avail warranty worldwide if something goes wrong with your laptop. The only negative is that it does not have Windows pre-installed which you can get installed from a local shop Overall, a great and one of the best laptops under 30000 in India. Dell Inspiron laptop is powered by Intel i3 7th processor and comes with 4GB of RAM and 1TB of a hard disk. Intel i3 7th generation is a powerful processor that can easily handle day to day tasks along with a good level of multitasking and medium end games very smoothly. It has a 14-inch HD LED Backlit Anti-glare Display which is bright with good colour accuracy. The RAM can be expanded up to 8GB on this laptop if you want to have high-end usage and multitasking later. This laptop has all the necessary ports like 2 USB 3.0, 1 USB 2.0 and 1 HDMI port. It also has inbuilt dual speakers and a CD/DVD drive. The battery life is around 3.5-4 hours and the laptop is very lightweight, weighing only 1.9 Kg. If you are ok with the Linux operating system, then you can buy this laptop, or you can check the windows variant of this laptop. The price on Window laptop is higher (around 30000) compared to Linux variant (around 25000) because you get the original Microsoft Windows and other software preinstalled. It is the one the best 14-inch laptop available under 25000 and comes with a standard 1-year onsite warranty from Dell. HP Notebook offers a great value for money for a budget of under 30000. It comes with an Intel i3 7th Generation processor with 4 GB of DDR4 RAM which is one of the best configurations you would see in this price. It has a storage of 1 TB which is sufficient for a lot of users. The quality is solid and looks amazing with the silver color tone. The display on this laptop is 15.6 inch in size with Full HD resolution. The colors and the viewing angles are best and offer the best visual experience while watching media content or working for long hours. With this configuration, this laptop suits best for users looking to buy a laptop for day to day usage. Watching video content, working on Microsoft office and other low to mid-end software is performed smoothly. This laptop runs on the Windows operating system so it saves you from any hassle of getting windows installed by yourself. The battery on this laptop gives a backup of around 4 hours which is decent and this laptop is a full-fledged laptop with best features and is easily the best laptop under 35000. 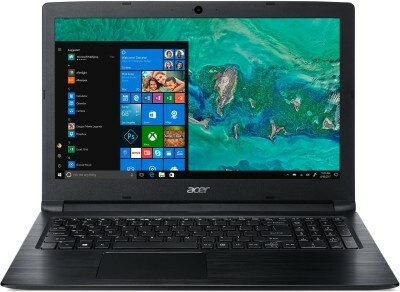 This is a great value for money laptop from Acer. It comes with AMD Ryzen 5 chipset which performs very well. You can expect its performance to be the same as an Intel Core i5 processor. The laptop is well built and weighs around 2.2 Kg. The looks are very basic though. The AMD chipset has powerful GPU as well which should help in gaming and other GPU intensive applications. The display on this Acer Aspire laptop is 15.6 inches large and has Full HD resolution which produces crisp images with natural looking colors. The brightness and viewing angles are decent as well. To handle multiple software and applications, there is 4GB of RAM which can be expanded with the extra slot available. 1 TB of hard disk storage is provided to store a ton of data on your laptop. There are 3 USB ports and 1 HDMI port to connect a TV, projector or any other electronic device. The battery is 2 cell and should last for around 4-5 hours on a single charge. The charger that comes with the laptop is 45 W AC Adapter which should charge the laptop in less than 2 hours. Windows 10 OS is already preinstalled on the laptop so you can start using it straight after first boot up. Overall, the laptop performs well and we think it is a great deal under Rs. 30000. This is an affordable laptop from HP which comes with the latest AMD Ryzen 3 processor which is more powerful than the Intel Core i3 in both CPU and GPU performance. Ryzen 3 is Dual Core chipset with a base frequency of 2.5 GHz and Turbo Boost of up to 3.4 GHz. There is 4GB of RAM to handle multiple apps and software and 1TB of hard disk storage to store all your music, movies, pictures, documents, etc. The performance of the laptop is really good and you won't face any lag in the day to day usage. The laptop handles multitasking really well. If you use heavy software then you can add 4GB more RAM and make it a total of 8GB. The laptop is suitable for basic home use, office use, and college use as well. The display on the laptop is 15.6 inches large and has a resolution of HD only. At this price point, you can't really get a Full HD display so it is not a deal breaker. The display quality is good though with nice color reproduction and viewing angles. The laptop comes installed with Windows 10 Operating system. There are 3 USB ports and 1 HDMI port in this laptop to connect external electronic devices. You can also add an SSD to this laptop. Overall, it is a solid laptop with a great performance from HP under 25000 to 30000 price range. So this was our list of best laptops under 30000 available in India as of 2019. We hope the list was helpful to our users. If you are still confused then take a look at our favorite laptop under Rs. 30000.